The acrimony between the Napa Valley Wine Train and the city of St. Helena used to be the stuff of local legend. Stories abound about the mayor lying down on the tracks in protest, and the equally pugnacious Wine Train owner daring the city to wage war in court against him and a team of attorneys funded by his vast Rice-A-Roni fortune. Fortunately that’s all water under the railroad culvert, with the new owners of the Wine Train taking an infinitely friendlier, more positive approach to their northernmost neighbors. We recently had the pleasure of meeting Scott Goldie and Greg Brun of Brooks Street, the real estate development firm that acquired the train in 2015 in partnership with Noble House Hotels & Resorts. Goldie and Brun are open, creative, and keenly aware of the county’s struggles with workforce housing and transportation. They say they’re committed to helping solve those problems, and their ambitious plans bear that out. They’re working on replacing their McKinstry Street station house with a hotel, building workforce housing near the Napa Valley Transportation Authority bus station on Soscol Avenue, moving their maintenance and food service operations to Napa Valley College, and teaming up with the college to train students in hospitality and rail operations. And that’s just in Napa. In St. Helena, they’re studying the feasibility of a hotel that could straddle both sides of the tracks near Fulton Lane, using land the Wine Train already owns on the east side and the former Teen Center site on the west side. The city is using the old Teen Center as a temporary headquarters for the Public Works Department, and members of the SHAPE Committee and the City Council have discussed selling it to the Wine Train for a small hotel. In the meantime, the City Council has invited the Wine Train to — gasp! — drop off passengers in St. Helena during December’s Jingle All The Way promotion. That could be the first step toward more extensive drop-offs. 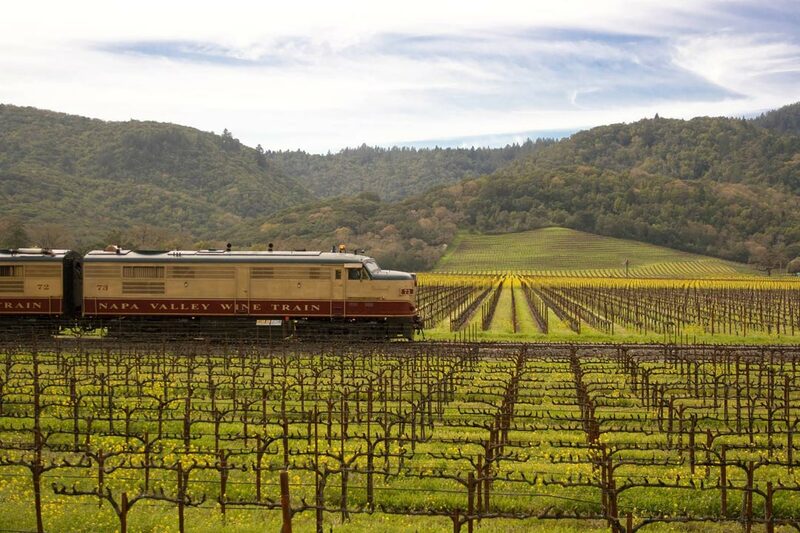 For example, passengers could ride Upvalley on the morning train, spend the afternoon browsing shops, and ride the dinner train back to Napa. Passengers are already disembarking in St. Helena, but they’re being driven directly to wineries including Raymond and Castello di Amorosa for deluxe tours and tastings. Goldie and Brun are also interested in providing commuter transit by teaming up with businesses and offering incentives for employees to ride the train to and from work, using Wi-Fi to get some work done on the way. State regulations limit the train’s speed to 25 mph, so it won’t be THE solution to Highway 29 gridlock. But with enough buy-in from employers and workers, it could be A solution. In their low-key way, Goldie and Brun made it clear that a new day has arrived in St. Helena-Wine Train relations. They want to add value to the community, but they’re not going to push anything. They’re waiting to be invited. We encourage the city to extend that invitation. Let’s turn what used to be a bitter foe into a valuable ally.